Community Home Repair creates safer places to live by addressing health & safety concerns with efficient home repairs and adaptations, to support long term housing solutions for low-income homeowners and their families. When a damp spot in his yard turned into a geyser, Ernesto called a local plumbing company that gave him an estimate of over $3,000 to replace the main waterline. Ernesto is only able to work part time and averages $600 a month of income. He had been a full-time teacher, but brain tumors resulted caused him to lose part of his vision and his ability to teach. Ernesto felt like his only option was to eliminate the expensive bill by shutting off the water to his home. Along without running water, he lost his only source of cooling – an evaporative cooler on the roof. Ernesto was worried about making it through the Tucson summer. He called his city council office who referred him to CHRPA. When Abi stopped by to assess the repairs, Ernesto mentioned that he and his brother would be willing to dig the trench, but he didn’t have the tools. CHRPA instantly loaned him a shovel and mattock. Once the trench was complete (in record time), Dustin went out to Ernesto’s home and quickly laid the new pipe. Ernesto watched while Dustin worked, asking him technical questions about modern plumbing and telling stories from his days as a teacher. 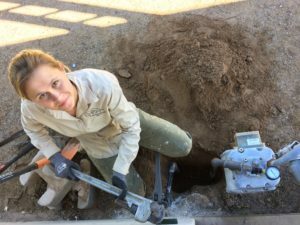 With donated plumbing supplies and a half day of labor, this job totaled less than $400. Instead of having to pay thousands of dollars on a payment plan, Ernesto received these services at no cost, and can live in a home with running water and cooling—two basic necessities in Tucson. 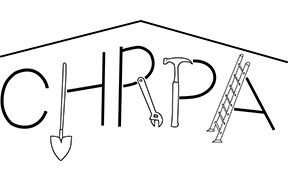 Community Home Repair Projects of Arizona (CHRPA) believes that everyone deserves to live in a safe and healthy home. Each year our staff and volunteers complete emergency home repairs in over 1500 homes around Pima County. Because of the generous support of our donors across Southern Arizona, we can provide these services at no cost. Each dollar given supports our ongoing home repair efforts. Our crews hear stories every day from people like Ernesto who desperately need some help with their home.